Extreame Savings! 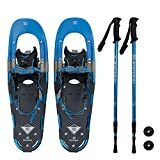 Up to 47% off on Snowshoes at Hit The Ice Box. Top brands include Winterial, G2 GO2GETHER, & Airhead. Hurry! Limited time offers. Offers valid only while supplies last. Winterial Back Trail Snowshoes/Recreational Snowshoes/Snowshoeing/Snowshoe/Backcountry Snowshoeing/Rolling Terrain Snowshoes/POLES INCLUDED!